Following a 2-year period of plan approval and newbuild supervision services provided by Bernhard Schulte Shipmanagement’s project focused business, Schulte Marine Concept, BSM has announced that its Mexico based Ship Management Centre has commenced management of Reforma Pemex, the first of two offshore ‘flotel’ accommodation vessels owned by Petroleos Mexicanos International (PMI) and chartered to the Mexican National Oil Company Petroleos Mexicanos (PEMEX). Commencing operations from the beginning of January 2017, Reforma Pemex set sail in late November from the Barrera Shipyard in Vigo, Spain en route to the Gulf of Mexico where she will host up to 700 PEMEX personnel working on offshore platform fields in the Campeche area. Reforma Pemex is 131m in length with a beam of 27m and provides hotel standard accommodation and services for 700 personnel. With a service speed of 12 knots and DP3 capability, she is fitted with a “walk-to-work” motion-compensated gangway system that enables transfer of workers between the offshore platforms and accommodation vessel. 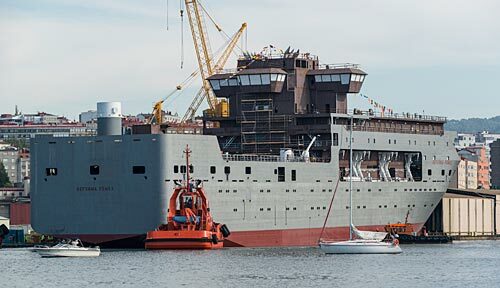 Her sister vessel, Orgullo Petrolero, is currently completing sea trials and crew familiarisation training at the Navantia Shipyard in El Ferrol Spain and is expected to be delivered at the beginning of 2017. With a stringent focus on safe operational activity, technical and crew management services are provided by BSM Mexico, with offices in Mexico City and Ciudad del Carmen, and further strengthens the Schulte Group’s growing position within the Offshore market.